The Egyptian president opened Monday an international donors' conference on reconstructing the war-torn Gaza Strip, meant to raise at least $2.8 billion for the battered coastal area from 80 donor countries and international organizations. Hosni Mubarak addressed the gathering that included French President Nicolas Sarkozy and Palestinian President Mahmoud Abbas, along with 45 foreign ministers. Among the high-profile visitors was Hillary Rodham Clinton, who arrived Sunday in this Red Sea resort for her first trip to the Middle East as US Secretary of state. UN Secretary General Ban Ki-moon also addressed the gathering, saying he visited Gaza and saw with his "own eyes the agony of the people" there. Gaza's Hamas rulers have not been invited to the gathering. "The situation at the border crossings is intolerable. Aid workers do not have access. Essential commodities cannot get in," Ban told donors. "Our first and indispensable goal, therefore, is open crossings. By the same token, however, it is therefore essential to ensure that illegal weapons do not enter Gaza." In his opening speech, Mubarak said the "priority is to reach a truce between Israel and Palestinians" and said Egypt would continue its mediation between the two, including for a more permanent Gaza truce. "I see a momentum in peace efforts. I look forward that this year will be the year of peaceful settlement between Israelis and Palestinians," Mubarak said. He added that Egypt was trying to get Israel to "modify its position on reaching a truce" - comments referring to Israel's demand that a truce be linked to the release of a captured Israeli soldier. Mubarak warned Hamas not to treat the donors' pledges as a "conquest of war" and cautioned that rebuilding Gaza following Israel's three-week offensive in January will depend on several factors, including a long-term truce and the opening up of the area's closed border crossings. He called on Palestinian factions to work toward reconciliation and forming a unity government to oversee the rebuilding. Taking the stand, Sarkozy urged "responsible Palestinians" to seek peace with Israel - and said the release of the captured "Israeli soldier Gilad Shalit in exchange for Palestinian prisoners is a priority." "You must admit that there is no other road to the creation of a Palestinian state but to engage resolutely in searching for a political solution and engage in a dialogue with Israel," Sarkozy said in a clear message to the militant group. Abbas told the donors that financial aid without a political settlement to the conflict with Israel would be "insufficient." "We are all conscious that the reconstruction and development efforts will remain insufficient, powerless and threatened in the absence of a political settlement," Abbas said at the conference in Sharm El-Sheikh. "We appreciate your presence and the financial, economic and technical support that you are giving to the Palestinian people but we insist on the pressing need to achieve substantial progress towards a just settlement (of the conflict with Israel). "The Israeli war machine has destroyed our institutions, our schools and our infrastructure that we built with the help of friends and brothers," he added. Abbas urged the international community to act to save the peace process. According to him, the world must ask the next Israeli government, led by the Likud's Benjamin Netanyahu, to "commit to a settlement based on two states and to respect signed agreements". Hamas wrested control of Gaza from Abbas' forces in June 2007, triggering a border blockade of the territory by Israel and Egypt. Abbas' prime minister, Salam Fayyad, has prepared a 53-page reconstruction plan for the donors, including detailed damage assessments. For example, fixing war damage to infrastructure and homes would cost $501 million, according to the plan, which says 4,036 homes were destroyed and 11,514 damaged. Fayyad warned Sunday that reconstruction can only move forward if Gaza's borders, blockaded since Hamas' bloody takeover, open again. Israel has linked the opening to the release of Shalit, held since June 2006 by Hamas-allied militants in Gaza. Indirect talks between Hamas and Israel on a prisoner swap - Shalit for hundreds of Palestinian detainees - have dragged on and prospects remain uncertain. Egypt has also kept its crossing with Gaza closed since the Hamas takeover and would only open them if Abbas' forces take up positions on the Gaza side. Fayyad said that with open borders and sufficient aid, reconstruction could begin in six weeks. He wants most of the aid to be funneled through his West Bank-based government. He already administers huge sums of foreign aid - $7.7 billion for 2008-2010 - and has been sending $120 million to Gaza each month for welfare and salaries of Abbas' former civil servants. Other aid, such as for rebuilding homes, would go directly to the bank accounts of Gazans. The US pledged $900 million. The European Commission, the executive arm of the European Union, was to give $554 million to the Palestinians for 2009, of which about half is expected to go to Gaza. Gulf states have promised large sums - led by $1 billion from Saudi Arabia. However, Palestinian officials expressed concern that the Gulf countries would set up their own fund and not channel it through the Palestinian Authority. Hillary Clinton, on her first foray into Middle East diplomacy, declared the Obama administration committed to pushing intensively to find a way for Israelis and Palestinians to exist peacefully in separate states. She used the international donors conference to issue a blunt call Monday for urgent action to forge a comprehensive Arab-Israeli peace. "We cannot afford more setbacks or delays - or regrets about what might have been, had different decisions been made," she said in apparent reference to the failure of previous peace initiatives, including those pushed vigorously by her husband's administration. With the Obama administration's Mideast peace envoy, George Mitchell, seated behind her at a conference meant to raise billions to help the Gaza Strip recover from its recent war with Israel, Clinton said President Barack Obama would continue the Bush administration's focus on seeking a two-state solution that entails Israel and a sovereign Palestinian state coexisting in peace. She made it clear, however, that Mideast leaders could count on Obama to take a more active approach than did his predecessor, George W. Bush. "It is time to look ahead," she said, with an eye on the human aspects of what years of regional conflict have meant for the Palestinians and others. "The United States is committed to a comprehensive peace between Israel and its Arab neighbors, and we will pursue it on many fronts," she said. Clinton, who was scheduled later to travel to Jerusalem to consult with Israeli government officials and to the West Bank to meet with Palestinian officials, said the United States was pledging $900 million to the international aid effort for the Gaza Strip. She gave no breakdown of the funds, but her spokesman, Robert A. Wood, said on Sunday that it included $300 million in humanitarian aid for Gaza and about $600 million in budget and development aid to the Palestinian Authority, which is based in the West Bank. The Obama administration is casting its contributions as a calculated effort to ensure that the money does not reach Hamas, the Islamist movement that rules Gaza and is viewed by Washington as a terrorist organization and not a legitimate governing body. "We have worked with the Palestinian Authority to install safeguards that will ensure our funding is only used where and for whom it is intended and does not end up in the wrong hands," Clinton told the conference. She did not explicitly mention Hamas but alluded to extremist elements. "It is time to break the cycle of rejection and resistance," she said, "to cut the strings pulled by those who exploit the suffering of innocent people." "(Rocket) attacks must stop," she said, stressing that the Obama administration is taking a wide-angle view of the humanitarian crisis in Gaza. "Our response to today's crisis in Gaza cannot be separated from our broader efforts to achieve a comprehensive peace," she said. "Only by acting now can we turn this crisis into an opportunity that moves us closer to our shared goals." "By providing humanitarian aid to Gaza we also aim to foster conditions in which a Palestinian state can be fully realized, a state that is a responsible partner, is at peace with Israel and its Arab neighbors and is accountable to its people," she added. Italian Prime Minister Silvio Berlusconi told the delegates that Clinton's presence at the conference "reminds us of the persistence" of former President Bill Clinton in pursuing a comprehensive Arab-Israeli peace deal. In her address, Clinton also said "we take inspiration from" a 2002 Arab-Israel peace plan put forward by Saudi Arabia. The Saudi proposal - later adopted by the Arab league - offers peace to Israel in exchange for land seized by the Jewish state in the 1967 Middle East war. 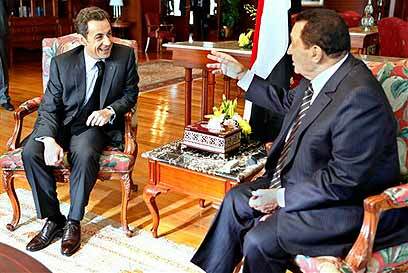 See all talkbacks "Mubarak: Priority is to reach truce "